St Mary's Roman Catholic Church would like to welcome you to our parish's web page. 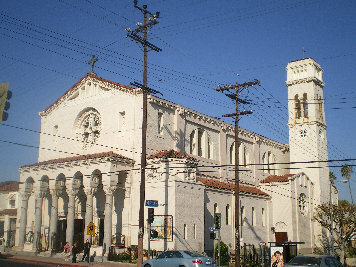 St Mary's is located in the Boyle Heights District in the City of Los Angeles. St Mary's is working through the mission of the Salesians of Don Bosco (or the Salesian Society, originally known as the Society of St. Francis de Sales). It is a Roman Catholic religious order founded in the late nineteenth century by Saint John Bosco in an attempt, through works of charity, to care for the young and poor children of the industrial revolution. The Salesians' charter describes the society's mission as "the Christian perfection of its associates obtained by the exercise of spiritual and corporal works of charity towards the young, especially the poor, and the education of boys to the priesthood. The order is named for St. Francis de Sales, an early-modern bishop of Geneva."